Social insects like ants, bees and wasps live in colonies headed by one or a few queens who lay eggs, and chiefly comprise sterile workers who take care of the nest and rear the queen's brood. These insects are broadly categorized into highly evolved and primitive species, depending on levels of social organization. While the highly evolved societies are interesting for studying complexities of social life, the primitive societies help us gain insights into how such complexities can evolve. Ropalidia marginata, a paper wasp from peninsular India, is a primitive species that has now been studied for about three decades at the Indian Institute of Science by Raghavendra Gadagkar and his research group. These wasps build nests with paper pulp, and the adults are mostly females, though a small number of males are occasionally present--they live on the nest for about a week.Among the females there is a queen indistinguishable from the others by external morphology. Unlike in other primitive species, the R. marginata queen does not use aggression either to maintain reproductive monopoly or regulate worker activities. On the other hand, the queen seems to be using pheromones like the queens of highly evolved societies to signal her presence to her workers. 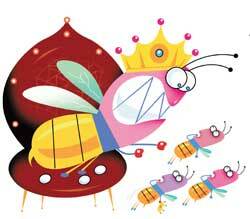 If the queen dies or is removed, the colony undergoes drastic change within minutes. One of the workers suddenly becomes extremely aggressive, and physically dominates all other individuals. Over the next few days, she gradually decreases her aggression, develops ovaries and begins to lay eggs. This individual is designated the potential queen. The transition of a normal worker to a potential queen and then to a functional queen is a fascinating phenomenon. The potential queen's aggression reaches abnormal levels. But why does she show such high levels of aggression, which obviously demands a lot of energy? This is all the more fascinating because the queen herself is non-aggressive. It is likely that the extreme aggression is to fight competition to prevent nest mates from developing their ovaries. If the queen's pheromones help to signal her fertility and maintain her status, then the potential queen fights competition through aggression until she acquires pheromones herself. Shakti Lamba and others at the Indian Institute of Science in Bengaluru carried out an experiment to test this hypothesis. The potential queen's aggression scaled with the number of workers present in the colony. Of course she needed to be more aggressive if there were large number of competitors. They also checked if the potential queens were more aggressive towards more dominant workers and those with better ovaries. But the potential queens didn't seem to care for such qualities. They were agressive anyhow. Another hypothesis, one that appeared far-fetched, was that the potential queen's heightened aggression boosted her own ovarian development. The group nevertheless decided to test it. They took two-member colonies and removed the queen. The only remaining individual was then the potential queen without any nest mate to beat up. They waited till she laid eggs, and compared the time taken for egg-laying by lone potential queens with those who had nest mates. The results were spectacular the loners took much longer to lay their first egg compared to the ones in a social environment. The authors concluded that the potential queen's aggression serves to boost her ovarian development, rather than to suppress ovarian development in her nest mates. Due to its differences in social organization from other primitive societies, and many similarities with highly evolved societies, the R. marginata's is an ideal system for studying mechanisms of social evolution. Since queens in typical primitive species use aggression to suppress ovarian development in the workers, it is possible that the reverse hormonal changes occur in the R. marginata potential queen when she becomes aggressive. This experiment also suggests the queen in a group that starts a colony achieves greater reproductive fitness than a solitary foundress. This research opens up new avenues for studying aggression-induced hormonal changes in evolution of social organization.